Pictured: Jazmin Vollmar, Grace DeWolff, Luke Erickson, Sebastian Weigman on the set of "Outliers"
In 2012, Grace had developed the "Project Empty Space" program at the Alchemist Theater. The project's mission was to create a season of theater by and for the community: to develop the creative spark of previously unpublished playwrights and new theatre-makers, and connect the community to quality production values. During the planning phase, the owners of The Alchemist (and producers of the Project Empty Space projects) pushed Grace to write her own play. With her passion for education, Grace wrote about a subject close to her heart: the trials and tribulations of being the "weird kid" in school. Kids with creative and unusual tendencies are often ignored, reprimanded, or rewarded in ineffective ways during their time in a public learning institution - what kind of "special" student needs attention, and in what ways? With major artistic contributions from an excellent cast (pictured right), "Outliers" was a short evening of theatre that sparked many conversations about the public education system. If you'd like to learn more about the production, or have a look at the script, you can read the review here or use the "Contact" page! In 2003: Shorewood High School's drama program took the production "Bat Boy, The Musical" to the American High School Theatre Festival. Duties included performing in the chorus and running props. In 2011: Grace participated in a University of Wisconsin internship program for Jodi Kaplan's Booking Dance Festival. Duties included street team activities (pictured left), assistant stage management, education coordination, and incredible communication skills. Read all about it here. In the future: Grace is looking for a way back to Edinburgh for the 2014 Fringe Festival. Visit the "contact page" if you could use her skills! In 2010, Grace acted as Stage Manager for Youngblood's production of Drive Me To Arson. 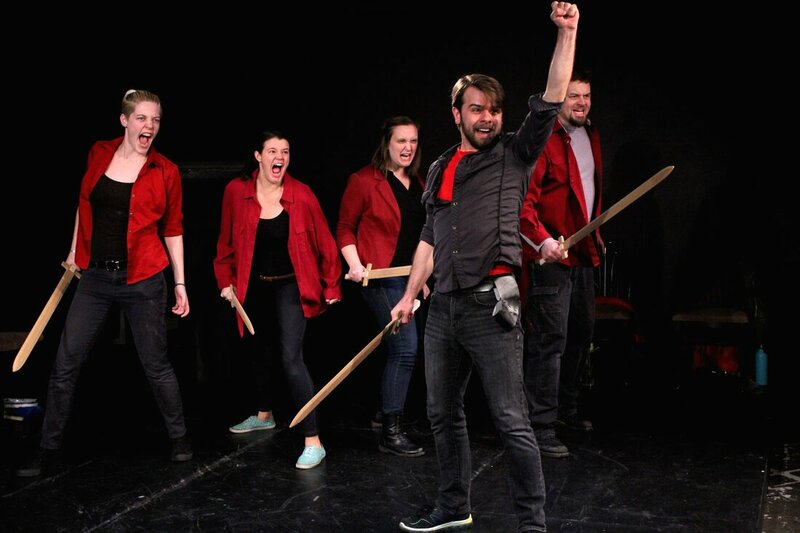 With an incredible cast and crew from her Milwaukee home, Grace got to join the technicians of the Minnesota Fringe and transfer their home-grown play from Youngblood's rehearsal space to the beautiful University of Minnesota's Rarig Center Thrust. In 2006, Grace (center of photo) spent a summer in Oxford with the British American Dramatic Academy. Studies included Shakespeare, movement, voice, and scene work from contemporary British writers. Master classes included mask work, stage combat, and one-on-one audition training. Grace's favorite field trips included a play at The Globe, and a pilgrimage to Shakespeare's grave. For a brief stint, Grace lived on the island of O'Ahu and quickly found the Honolulu Theatre for Youth. Grace spent a summer learning a little kabuki and a little Commedia Dell'Arte, and her activities inspired her to join Mid Pacific Institute's intensive drama program. Visit the "Contact" page if you'd like to travel with Gracie!